Discussion in 'Jazz on A&M/CTi/Horizon and Others' started by Captain Bacardi, Dec 19, 2011. All songs written by Eddie del Barrio, Herb Alpert & Stan Getz except where indicated. A complete departure from what Stan Getz usually had done on his records, and not necessarily a good thing. Getz's sound is still distinct, and considering he was undergoing treatment for cancer his playing was still strong. The tunes aren't really that good, though, as Herb Alpert intentionally wanted to put Getz outside of his comfort zone. It's not quite fusion, although it has more of a pop element to it. There's a couple of decent tracks - "Amorous Cat" is my favorite, and the title tune is pretty decent - but overall this album just isn't that strong. 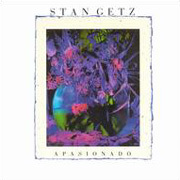 Mr. Getz had actually recorded another album's worth of material by the time this was released, which was more traditional jazz, but the project was shelved in favor of Apasionado. The master tapes were remastered in 2004 and released as Bossas And Ballads: The Lost Sessions. I have heard cuts from both Apasionado and the latter, and personally, I prefer Bossas And Ballads. I put this album in my queue last night, followed by Bossas and Ballads, and by far I definitely prefer the latter. Apparently this later release was recorded in 1989 but shelved by A&M for reasons known only to them. (And of course, Universal stuck it on the Verve label rather than give A&M credit for it.) I found Apasionado to be more like background music than anything. I never really cared for it that much.